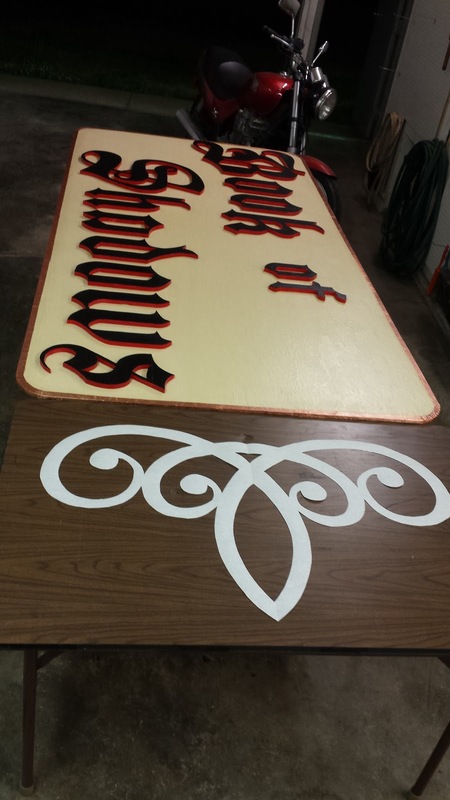 Having finished the main sign, I started working on the accent pieces. 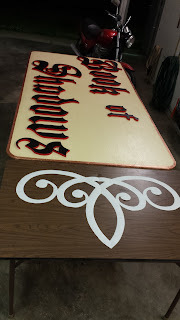 Because the new sign is only half the width of the old sign, I knew I needed something else to take up the extra room on the marquee, or the sign would look too small for the space. In keeping with the Victorian Gothic theme, I decided to try to make something that looks like filigree, or fretwork, to flank the sign on either side and take up some of that empty space. 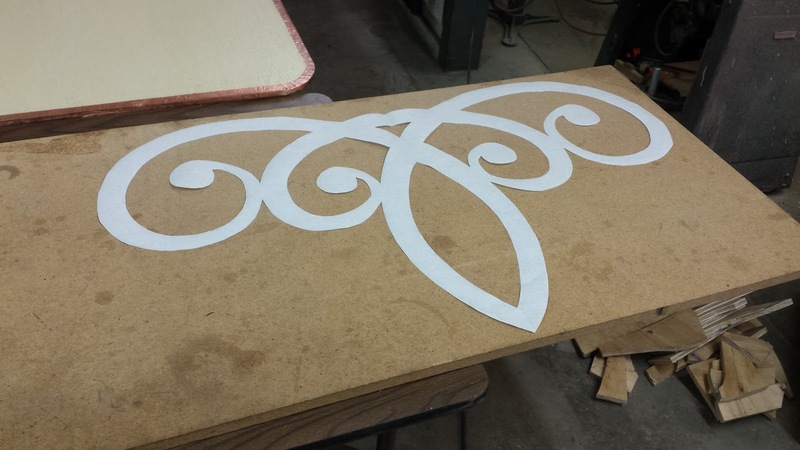 The first thing I needed to do was to determine the size of the fretwork, how much space I had to work with, and how big I wanted the fretwork to be. Also, how big of a piece of material I had to work with. 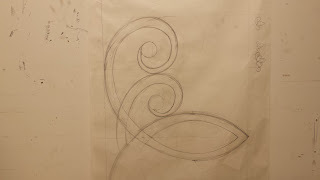 After roughing out how big I wanted it, and roughly what shape I wanted it, I looked around on line for some line art, but I didn't really find anything that fit the bill. I'm not great at drawing, but when pressed, I usually come up with something passable. 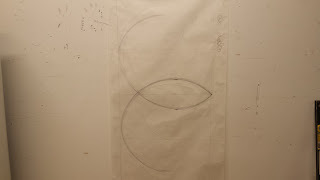 So, I got a piece of butcher paper roughly the size of what I needed and taped it to the wall. Then I just started doodling on the edge until I had a design that I was happy with. 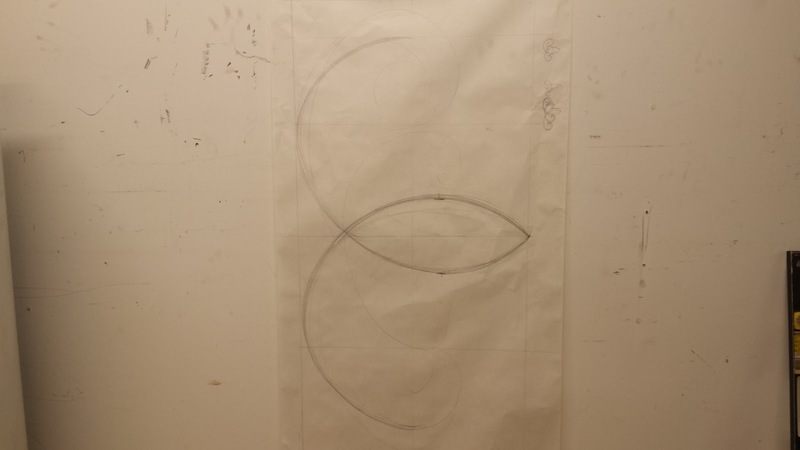 Once I had a rough design, I started sketching it out at 1:1 scale on the butcher paper. 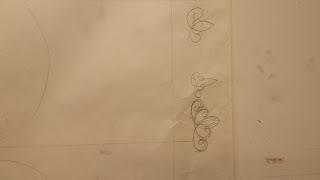 I made marks to block out where the outer edges should be, and I marked a mid-line, and a few other reference points to try to keep things symmetrical. It took a few tries. There was some erasing, but I ended up with something I thought would suit my needs. I only really had to focus on half of it. 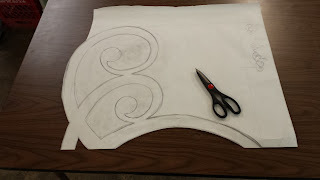 Once I got that half worked out, it would be easier to just fold the paper at the mid-line (the line of symmetry) and then cut out both sides at once. This ensures that both sides are perfectly symmetrical. I laid the paper template out on a table next to the sign to see how it would look in position. The dimensions for this fretwork element were partly based on the piece of particle board I had set aside to use for it. 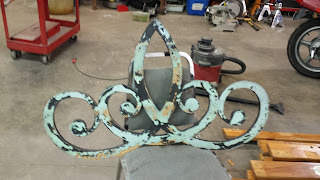 It was a scrap that had been laying around my dad's shop for years. In hindsight, I think I should have used a better quality piece of wood for this, but it worked out. I laid the paper template out on the particle board and lightly spray painted over the edges, leaving a ghost outline on the wood. This would be my cut line. 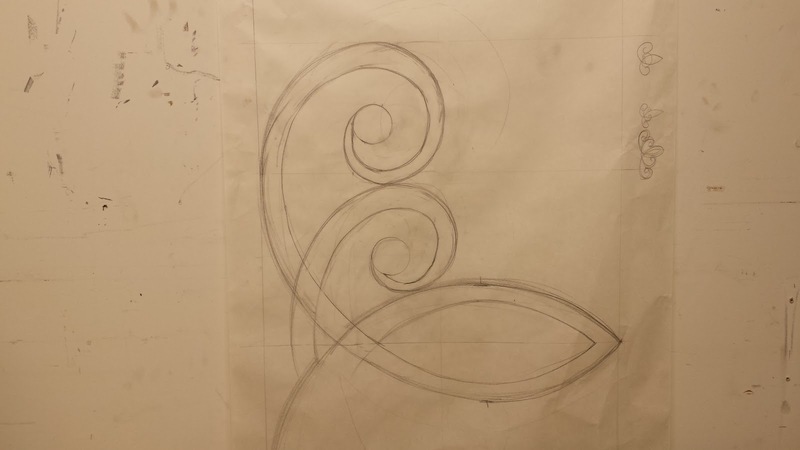 This trick is a lot quicker and easier than trying to trace around the paper template with a pencil. 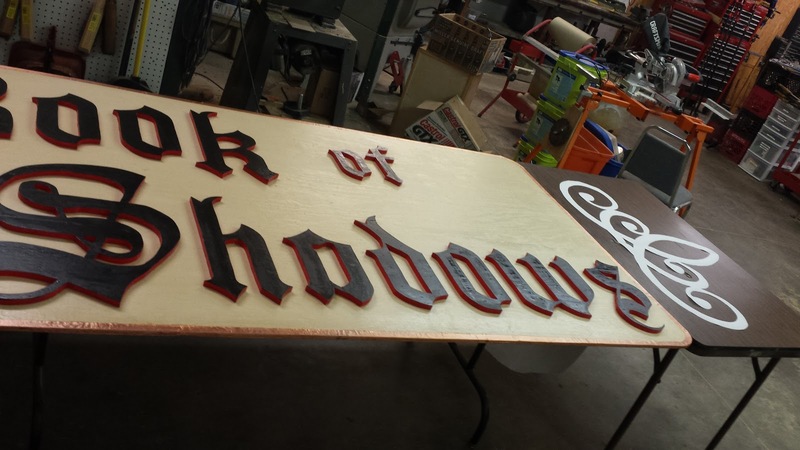 I made two ghost outlines of the template, one for each side of the sign, and then started cutting them out with a jig saw. Then I painted them both with at least two coats of black exterior paint. I'm hoping that I got them sealed well enough, because if the weather gets through to the wood, these things are just going to disintegrate. 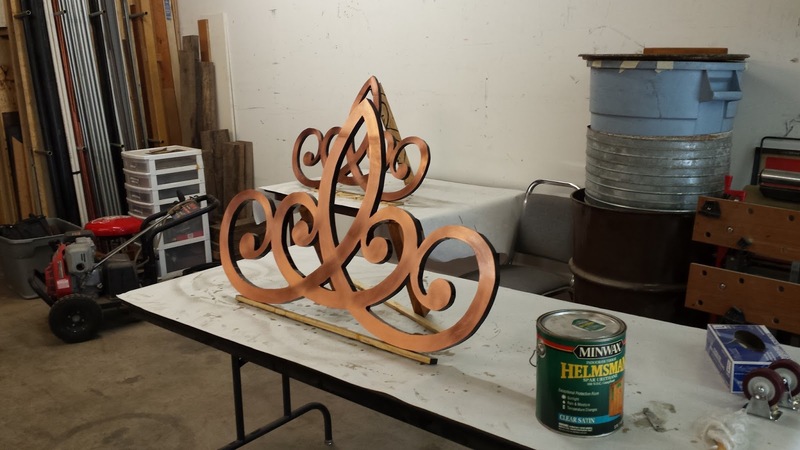 From an early stage I knew I wanted to tie these into the trim on the main sign by cladding them with copper. 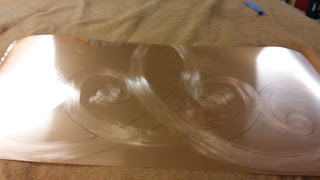 At first I thought of using the same copper foil, but that would have ended up in a wrinkly patchwork mess. 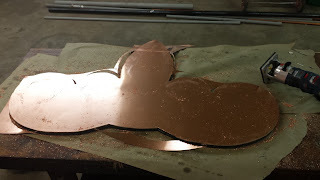 Around the same time I got that foil, I also got a roll of copper sheeting. It was also on sale, but it was still expensive. I think it was something like $90 for a ten foot roll. It's probably somewhere in the vicinity of 24 gauge thickness. Expensive. 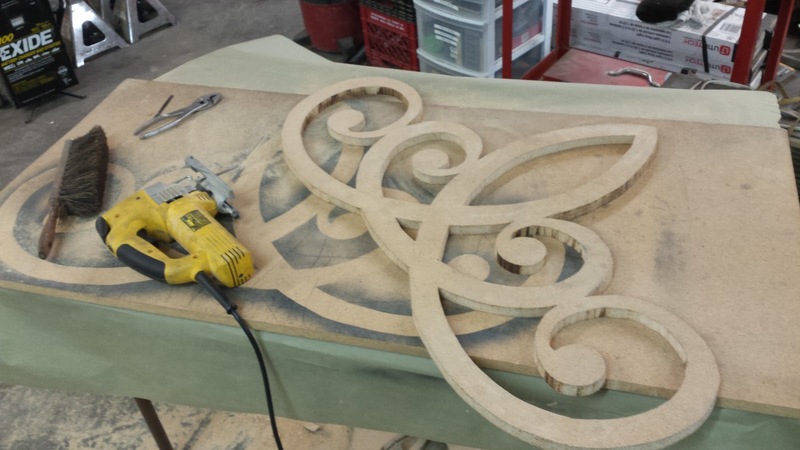 But it would do a nice job of cladding these pieces. 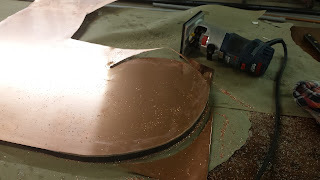 The only problem was, I had never tried anything like this before, and if it didn't work, I would have basically ruined $100 worth of copper sheeting. And I only had enough to do it once. Oh, there was one more issue. I thought my roll was 24" wide, but I hadn't looked at it in a while. Turns out it was only about 20" wide. Not quite as wide as the parts that I made. 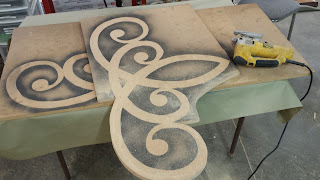 So, I would have to do the cladding in two pieces. I was hoping to avoid a seam, but I would just have to do my best to make it unobtrusive. 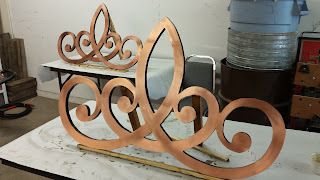 I laid the fretwork piece out on the copper and traced around it with a marker. 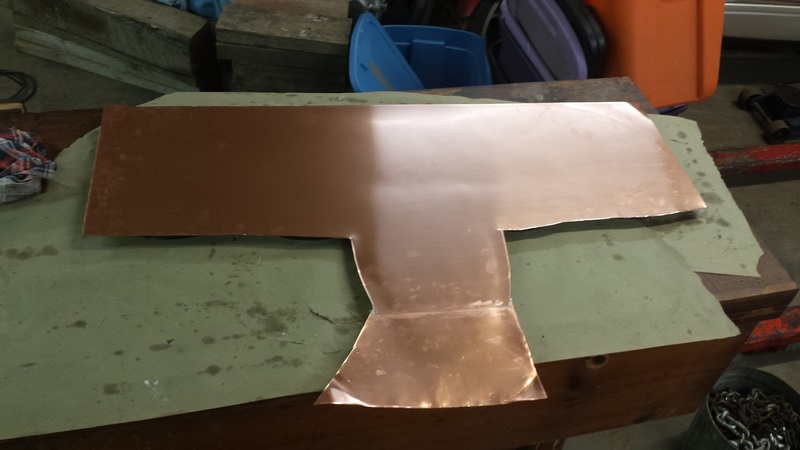 Then I used some emery cloth to rough up the surface of the copper inside the lines, so that it would adhere better to the wooden piece. 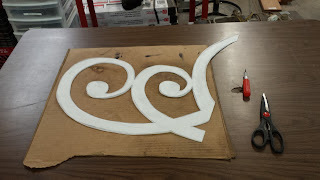 I spent some time thinking about what kind of adhesive I would use, ruminating on the lessons learned from putting the foil trim around the main sign. 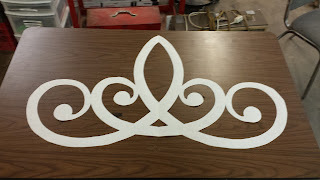 I decided on construction adhesive. I spread the construction adhesive out on the copper, inside my tracing lines, making sure to get good coverage, especially around the edges. For some reason I had a bad feeling about it as soon as I started. 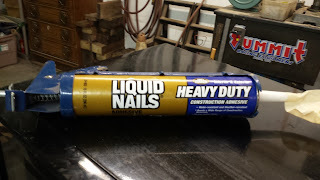 I had used Liquid Nail brand adhesive before with good results, but I went with the Heavy Duty variety this time, and it looked different from what I was used to seeing. I don't know why I doubted it, but I had a funny feeling it wasn't going to work. 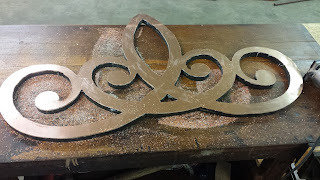 I set the fretwork piece in place and put it under weight to dry. It should have dried within a couple of hours, but by the next day, it still wasn't completely dry. I left it set for a couple more days, just to give it the best possible chance to cure, but when I came back to check on it, it was clear that it was separating at the edge in some places. When I picked at it, it pealed away easily. It had not adhered to the copper. 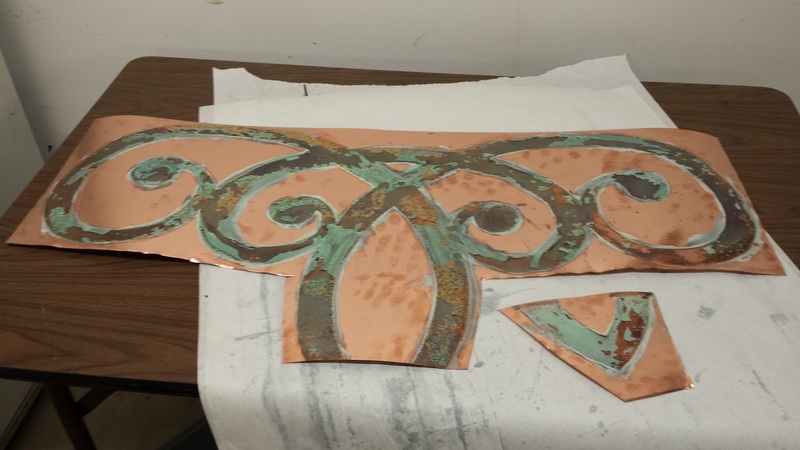 It looked to me like the water in the glue had corroded the copper as it was drying, and that may have inhibited the adhesion. 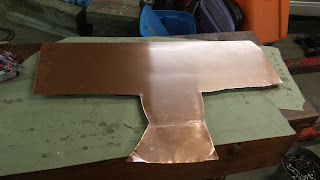 Thinking I may have ruined my copper sheeting, I carefully pried the copper away from the wood piece, trying hard not to damage it too much. Luckily it came off without destroying either the copper sheeting or the fretwork. I would at least get another shot at it. 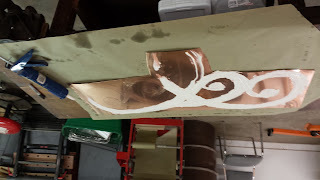 It did, however, take a LOT of scraping and sanding to remove all of the glue from both the copper and the wood. 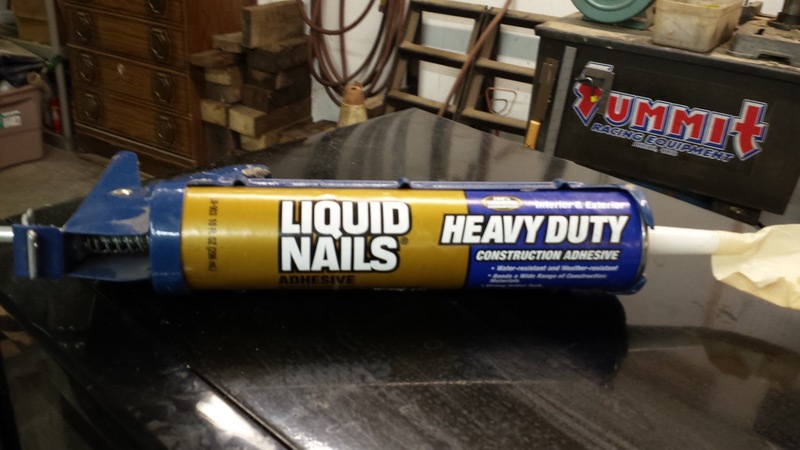 I looked at several other adhesives, careful to read the labels of each, and was surprised that several mentioned copper specifically as not recommended for. There must be something about copper that reacts with the glue and prevents adhesion. Apparently this is a thing, and I didn't know about it. Still thinking that construction adhesive was the way to go, I looked for another brand, that didn't mention copper in the "not recommended for" fine print. 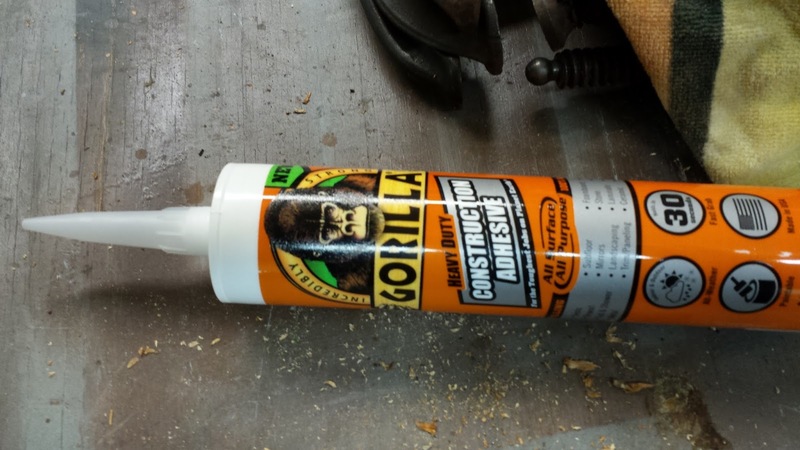 I finally settled on Gorilla Glue construction adhesive. It was more expensive by a good margin, but I already had over $100 into just these fret pieces. Not to mention the rest of the sign. .
Fortunately, the Gorilla Glue worked, at least well enough. Now, onto the hard part, routing around the edges. I had never really used a router before. My dad never taught them to me, other than to say to be leery of them. I think they scared him. He hardly ever used them, and he seemed overly cautious of them. 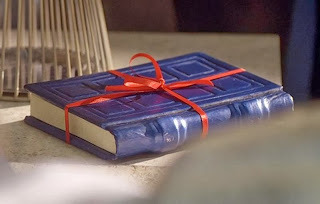 As a result, I had no experience with them, and he had instilled a little bit of his aversion for them into me. But a router is what the situation called for, so a router is what I used. 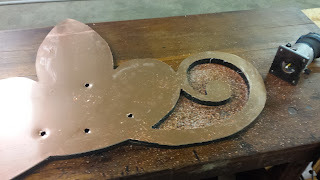 I managed to find a trim router and a flush trim bit amongst my father's tools and set about to remove the excess copper sheeting from around the fretwork. The flush trim bit has a bearing on the tip that rides along the edge of the work piece, so that you can not cut into the work piece by mistake. 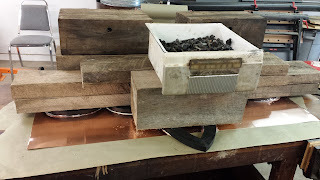 The bearing rides along the work piece and lets the cutter get right up to the edge without hitting it. It is used primarily for trimming laminate after it is glued to a counter top or other substrate. I was using it in exactly the same way, just that my laminate material was copper sheeting, not formica. I had to drill pierce holes in some places in order to rout out the interior curves. One thing that I was not prepared for was how painful it would be having the tiny shards of copper flying at me (especially at my off-hand) at very high speeds. 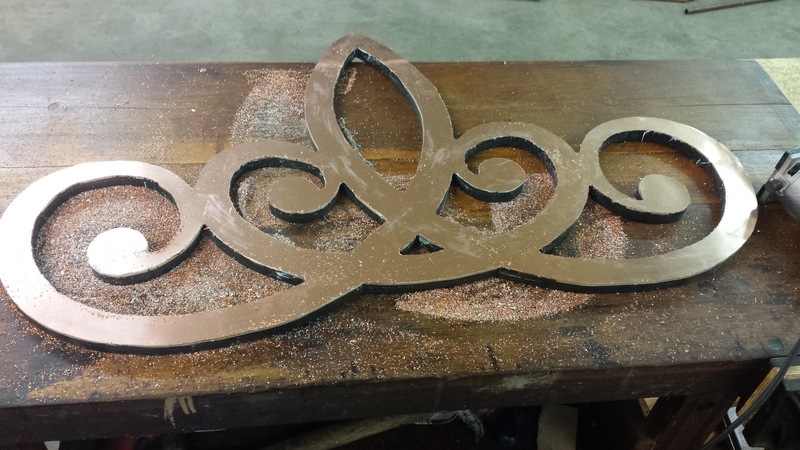 This process made a huge mess, and didn't leave much usable scraps, but when it was done, it ended up looking pretty much like I had hoped that it would. Even the small seam at the tip didn't look that bad. I had to do a little work with a file to get down into all the little corners because the router bit is round and can't make a radius of less than 1/4 inch. 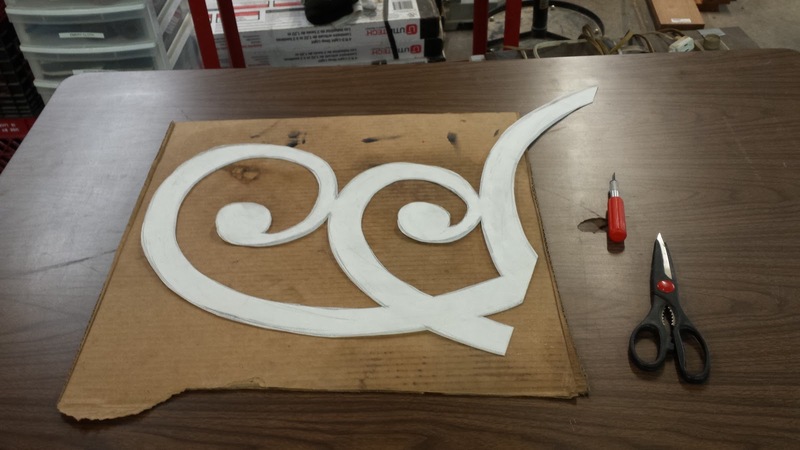 Also, all the the edges needed to be smoothed out with a file. The router left them pretty rough. 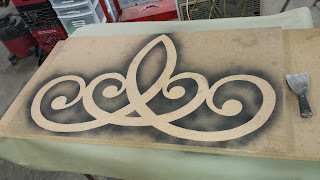 I had to touch up a few spots around the edges where the router cut into the paint. Then I gave each of the two pieces several coats of spar urethane on all sides. I'm actually quite pleased with the way they turned out. I'm still debating about how I'm going to mount them to the marquee. But we can cover that in another post. Looks nice! Congratulations on being able to rescue the parts despite the glue not working at first try. I think the sign came out well. I'm very pleased with it. It is a shame that part 4 (installation) may never happen. Unfortunately, the store is struggling. There's not much point in going to the effort of hanging the sign if the shop closes.